Dealing with distractions at the workplace has been a major problem for loads of workers. If not mobile phone notifications, then it’s a noisy co-worker or your fascination with social networking. So, it becomes imperative to discover ways in which you can overcome distractions at your workplace. 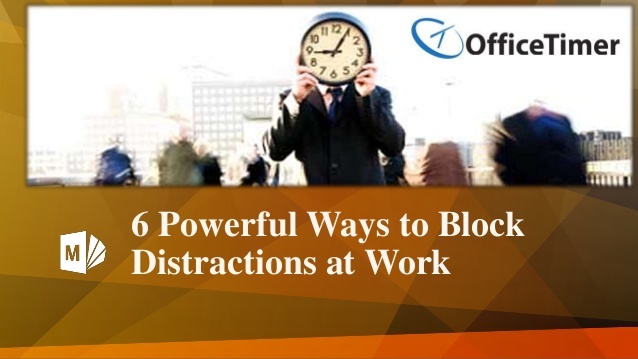 Are you searching for the best ways to avoid distractions while you work? Has your productively suffered due to your lack of concentration? What you need is detox from all the distractions and to regain the focus you have lost along the way. Here are some uncompromising tips to improve your focus during work. The first thing you should do after entering theoffice is creating a to-do list. This should include every accomplishment that you are planning to achieve during the day. While at work, stay focused on avoiding personal errands such as meeting up with friends or going shopping during lunch hour. Writing down all your tasks allows you to clear some space from your brain’s random access memory. You know that urgent feeling of annoyance when your colleague comes into your cabin for a chat while you are busy managing your deadlines? To avoid such situations, put up a Do-Not-Disturb board outside your cabin or on your desk to warn others that you are busy during a particular period of time. Smartphones have quickly evolved into one of the biggest distractions at workplaces. From checking messages on Whatsapp to playing addictive games for extended hours, your smartphone is your partner in crime. The best way to avoid this situation and increase the span of your focus is to keep your phone in a locker or a cupboard where you can’t see it. Almost two-third of employees who have Facebook or any other social media account, use it during work. Many even spend up to 2 hours or more on these sites. To avoid this, gradually train yourself not to open any social media website while at the office, unless your work demands you do so. Once you do this, it takes only 2 or 3 days to get into the groove of not caring about the latest happenings of the virtual world! For some, chat-over-coffee is simply unavoidable. It’s not bad, but you’ll realize that these conversations consume a lot of your valuable time. Also, getting up frequently for a cup of coffee just disrupts your work routine. So, it is best to decide on tiny breaks for your caffeine kick. Multitasking is not a great way to get your job done. When you do focus on two tasks at the same time, you only end up inefficiently dividing your concentration. So always complete one task at a time. The advantage of this mentality is that you dedicate enough focus to one particular task and finish it faster. The focus is what gets work done. By implementing these effective focus tips in your daily work routine, you can get rid of most distractions that you face at your workplace.